Doug Herman is a man who is easily led, believing almost anything that he is told so that it makes his own life easier. He simply drifts through life without ever gaining any kind of position or achieving anything relevant. 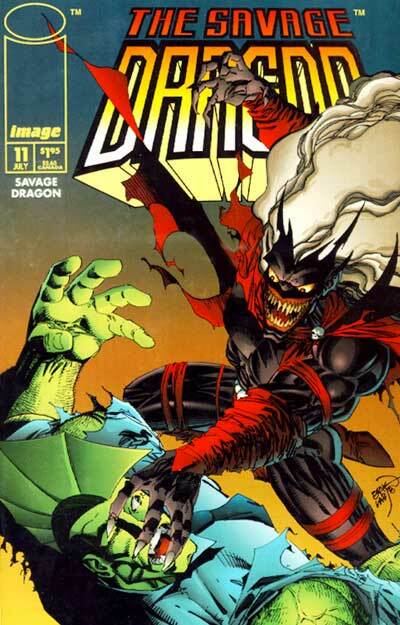 R. Richard Richards’s campaign of hatred against Dragon has influenced Doug and he now merges with the Fiend. Their mutual hatred will enable them to gain enough power so that they can attain whatever goal they desire, including the world itself. On the popular television talk show The Jerry Rivers Show, the guests gathered together attempt to uncover the mystery surrounding Dragon’s origins. An expert in extraterrestrials believes that Dragon is an alien whereas one priest thinks that he is a gift from God. A rival priest is insulted by this suggestion and thinks that Dragon is actually the Devil himself. Emily Schwartzblatt is also in attendance and maintains that the hero is her estranged son, Rodney. Bonnie Harris watches this show and is overcome with rage at the mere mention of Dragon. Bad Axe is beaten down by the ball and chain of Mace as he rejects his proposal to join the Vicious Circle. With the villain down, Alex Wilde approaches him with a counter offer from the Chicago Police Department. They have been monitoring his actions since his arrival on the crime-fighting scene and would like Mace to join their ranks. Dragon is surprised to be visited by Rapture in his apartment where she informs him that she is taking him out for dinner. They grab a taxi to the popular Pump Room restaurant where their first date is interrupted when Vanguard and Wally teleport inside. The duo has come for Lurch, the Morphling that they left in his possession a few months ago. Dragon takes his visitors outside where he explains that Lurch has been destroyed at the hands of OverLord. It is revealed how Frank Darling had desired to present when Dragon apprehended OverLord but it was deemed too dangerous for him. Lurch was programmed to pose as Frank and accompanied Dragon, only to be incinerated in the opening salvo of the ensuing fight. Vanguard warns Dragon that he best be certain that Lurch was truly destroyed as the Morphlings are tough to annihilate and his ruse may be exposed should Lurch have survived. Dragon returns to his meal before heading back towards his building where he invites Rapture up to his apartment but she surprises him by declining the offer and heading home. The new Fiend suddenly attacks Dragon and causes various injuries to his victim. Bonnie Harris is amongst the crowd watching this fight which ends when Dragon’s beeper goes off. It becomes clear to Doug Herman that he has been lied to as Dragon’s concern over innocents being in trouble reveals that he is not evil. This latest host body is killed and the Fiend departs, warning that someone hates Dragon even more than he does and once they are recruited, the Fiend will be back.